Sliding vs Hinged Glass Shower Door: Which Is Right for You? Picking a shower door sounds easy, right? Well, if you pick the wrong one, you could actually end up with a door that doesn’t even fit inside your bathroom. And that’s a bit of a problem. So how do you know which one to pick? There are two basic styles of shower doors, sliding glass shower doors and hinged glass shower doors. To help you figure out which one is best for your bathroom, we’re going to take a closer look at each type. You can’t simply pick a type of shower door by picking either hinged or sliding. There are many different types of hinged and sliding doors to choose from. We’ll take a closer look at the most common shower door styles below. This is your basic sliding the door. You might also know it by its second name, the bypass door. A sliding door doesn’t open inward or outward. Instead, it slides past the other glass panels on a track. A pivot door is a type of swinging hinged door. This door opens outward, but you can only install this type of door if you have a standalone shower. Most of the showers that use pivot doors are too small to have sliding doors, meaning they’re under 60 inches. If you have a larger shower, you can get a double-hinged mount for your pivot door. This allows you to open it both inward and outward. Round shower doors open inward. But the curve does give you more space inside the shower, which is why most people use round doors for corner showers. Because the shower doesn’t have any corners, you get more open space in your bathroom. And it’s easier to clean curved shower because gunk won’t build up in the edges. A bifold shower door is like a mix between a sliding door and a hinged door. Because most bifold doors have a hinge and a track. When you open this type of door, the door folds in on itself toward each other. Like the round door, this type of door is best used on corner showers. The entire shower is made of three glass panels. The door sits in the middle, and the two other panels are angled on either side. This makes it so the door is in open bathroom space instead of crammed against a wall. The door itself functions similarly to a pivot shower door. Knowing what kinds of shower doors are out there may not help you if you don’t know the advantages and disadvantages of each one. That’s why we’ve put together this detailed list about the pros and cons of hinged and sliding shower doors. We’ll start with the sliding glass shower doors. Here’s a quick look at some of the benefits that come with sliding shower doors. You can fit a sliding door on almost any shower, regardless of space. And sliding doors give you shower a seamless appearance. A sliding door won’t block the light from entering the shower, and it’ll pull the rest of your bathroom design together. The handles on sliding doors aren’t just handles. You can use them to hang towels, washcloths, and clothing. Because these handles stretch over the entire length of the door, you might even be able to hang several of these things at once. Small bathrooms don’t always have enough space for a hinged shower door. 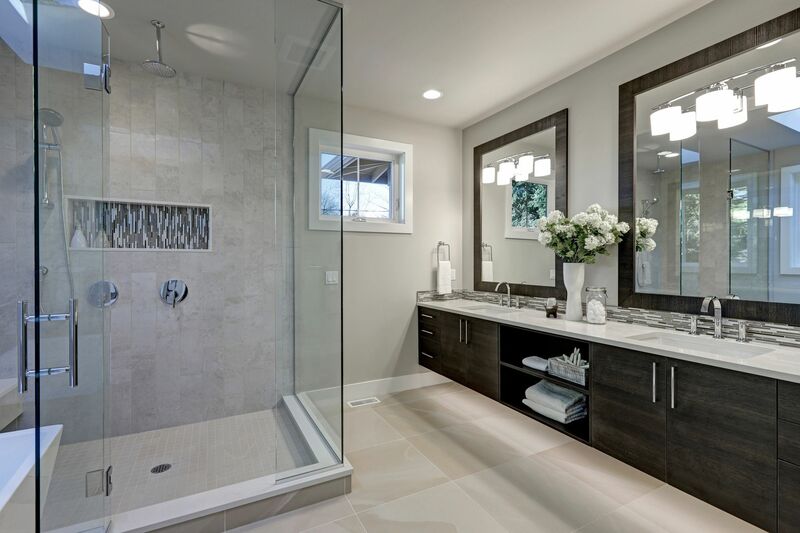 Since sliding doors don’t swing inward or outward, they can save a lot of open space in your bathroom. Most sliding doors can be open from either end of the shower/tub. That means you can access the shower from both sides. This isn’t only helpful when you’re turning on the shower and getting in, it also makes the inside of the shower a lot easier to clean. Despite all these advantages of sliding shower doors, these doors do have their fair share of cons as well. If you choose a sliding glass shower door, you must be prepared for the two following issues. The sliding door can only open so wide. For people who need a bigger opening, like parents trying to give their children a bath, this might pose a problem. While the sliding door makes cleaning the inside of the shower easier, it can be difficult to clean the door itself. Remember, sliding doors sit on tracks, and these tracks can gather water, soap, and other gunk over time. If you aren’t careful, they can start to rust as well. Hinged shower doors might take up more space than sliding doors, but they do have a set of benefits sliding doors don’t. Here’s a few of the most noteworthy. Because hinged doors can open outward at an angle of 90 degrees, they create a wide entry space. These types of doors are also safer for people who have challenges with their mobility. Hinged doors don’t need tracks, so you don’t have to worry about rust or a gunky buildup. This makes the cleaning process simple and straightforward. These types of doors, especially frameless hinged doors, blend into the rest of the shower unit and the surrounding walls. The design isn’t interrupted by large hinges or tracks. While the lack of a track is a nice feature of hinged doors, you also have to deal with space constraints. Some hinged showers might even leak. You must have enough space in your bathroom for hinged doors to swing open. If your bathroom is too small, you won’t be able to install this type of shower door at all. As you’re taking a shower, some of the water might leak under the hinged door. This means you’ll have to spend extra time soaking up the water with a towel after you’re done. What Type of Shower Door Is Right for You? So what type of shower door is right for you? It all depends on your bathroom and your personal needs. If you don’t have a lot of space, you might want to consider a sliding door. If you have a large bathroom and want something sleek and modern, a hinged glass shower door is a good option. Still not sure what type of shower you need for your bathroom? Take a look at this post that explains everything you need to know about glass shower enclosures.